To subscribe, click the red “SUBSCRIBE” button on the sidebar to your right, no spam emails, no sales pitches, just the Milton Real Estate Update in your inbox! For the .PDF version, please click the following link. 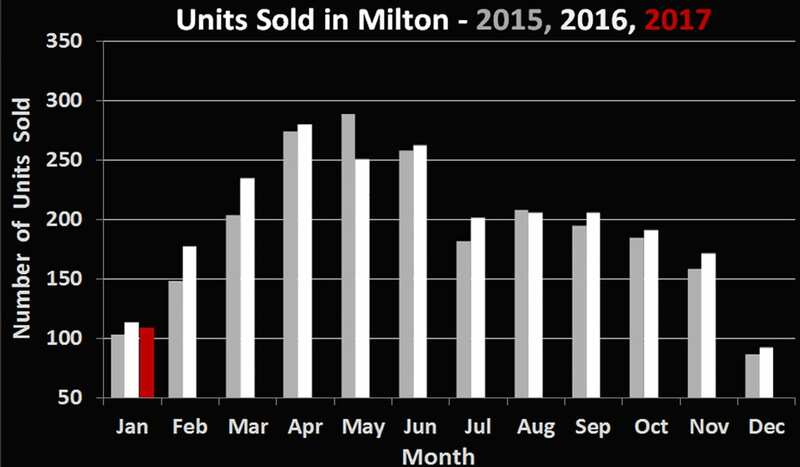 The Milton real estate market is off to the hottest start we’ve seen yet. A severe lack of inventory and a large supply of buyers have pushed prices to record levels, an unusual thing to see in the middle of winter. The 109 residential sales in January 2017 represent a 4.6% decrease over the same figure for January 2016. The average price on the other hand was a staggering $689,800, up more than 120k (or 21.2%) from the average of January 2016. 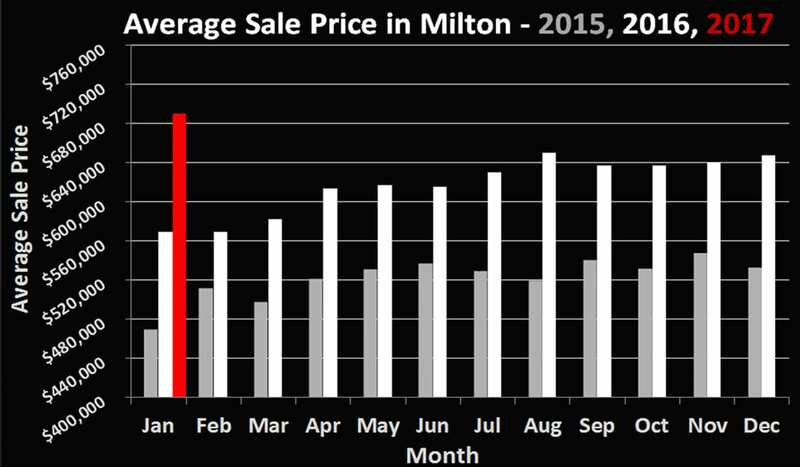 This is the highest level ever seen in Milton, and is due in part to extremely low inventory levels. Once again sellers appear to be waiting until the spring market to put their homes up for sale. Buyers on the other hand have not slowed down whatsoever, many having been searching for quite some time. The average sale price of a freehold Milton home in January was a mind boggling 106.4% of asking price, with 81% of homes selling over their asking price. Another reason for the increase are the prices released by builders in early January. Many people viewed these initial price offerings as absurd, and yet still Mattamy sold out in a matter of hours, and then once again a week later at prices which were on average 20-30k higher. It will be interesting to see where this year takes us, but if the rest of the year is anything like January, we may be seeing a repeat of 2016.